Rosie is a Baylor graduate with a Bachelor of Science degree in nursing. She is a charter member of the Baylor University Women's Council and has always been faithful to give her time and talent anywhere she is needed. She is married to husband, Arnie Cavazos, and has three married children and three grandchildren. Rosie is passionate about Baylor and BUWC because of the relationships she has developed with Baylor women, many of whom have become lifelong friends. Rosie is always there to tell how wonderful Baylor is how much it can impact your life. She is deeply grateful for what Baylor and the Baylor family has done for her. She tells the story of Thanksgiving her freshman year. She had no place to go and a professor and his wife opened their home to her for he holidays. 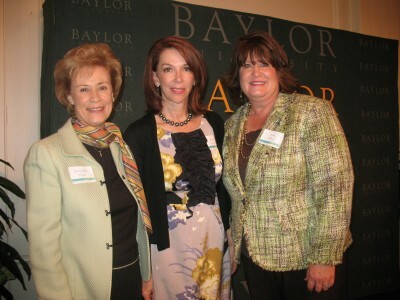 A Baylor regent one said to Rosie, "At Baylor you not only learn the 'why;' or the 'how.' You are also encouraged to answer the question 'what for'?" The Baylor experience creates opportunities for students to use classroom knowledge in real-life experiences, to see their lives not as a vacation, but rather as a vocation. Rosie is a role model for us all. It is our honor to present this humble yet deeply committed Baylor woman, Rosie Cavazos, as the 2008-2009 Woman of Distinction.